The contact adhesive and sealant that’s the Mechanic’s Choice. Seal-all adheres with superior strength to all substrates and materials except paper, cardboard and Styrofoam™. In a class of its own, the “repair-kit-in-a- tube” is ideal for automotive and garage repairs. Available in 2.0 and 1.0 fl oz carded packaging. 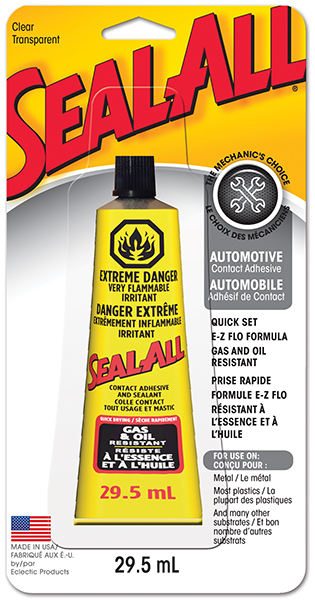 • Practical: Seal-All is resistant to gasoline, oil, paint thinner, and most solvents. Seal-All is also water resistant immediately upon application. • Quick Dry: Perfect for all your craft needs. Sets in 2-3 minutes. Fully cures in 2-6 hours. knobs and drawers, screens, tile, plumbing, gutters, and much.